Dukes’ blend of wry, observational humour and poetry reminds us in part of John Grant and his sublime album, The Queen of Denmark. But while Grant’s focus was more internal, more autobiographical, Dukes’ head is up and he is looking out, his attention on the “the weirdness, the anomalies, the resistance” of the American suburbs. These eccentricities may be ripe for lampooning but Dukes treats his subjects with affection; jauntily bouncing along in celebration or shuffling, dejected, as appropriate. American Songwriter Mag Premiere’s Our Video! The luscious music magazine American Songwriter has premiered our new video for “Meet You at the Bus.” Have a look and tell us what you think! All this sparkle and wonderment is due to the magic people at Reader Films in Austin. Especially Max Benitez (director) and Kristin Wernicke Benitez (producer). Whisperin and Hollerin: 9 Stars! Something of Dukes’ offbeat observations are in the same territory as David Byrne and there are also traces of the literate evasiveness of Michael Stipe and REM. Overall, this is a great leap forward from Dare Dukes’ equally fine debut album enhanced by lively and inventive musical arrangements. Surviving the Golden Age has a review up for Thugs and China Dolls, and, um, well, they kind of gush about it. 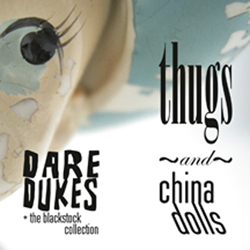 Smart music blog Listen, Damnit reviewed Thugs and China Dolls today and said some very, very nice things. Extra points for the use of “adenoidal”! …”a baroque-folk album built around acoustic instruments: banjo, mandolin, strings, horns, accordion and rich, beautiful vocal harmonies. Dukes sings in a distinctive voice at once tuneful and adenoidal, and his lyrics are smart and vivid. So nice to be associated with these stellar artists (hint, hint: Guided by Voices).